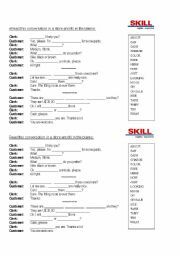 Fairy tale to completed with the verbs in the simple past (regular and irregular). Conversation in a store - students are supposed to fill in the blanks with words from the chart. 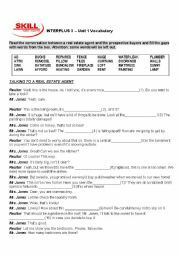 Conversation about buying a house - students are supposed to fill the gaps with furniture vocabulary. World cup mascot to be colored following the colors indicated in the picture. Excellent activity for teachers who want to work with law, crimes and punishments. 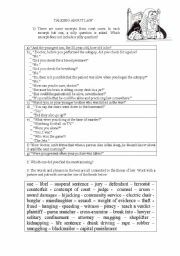 Students will improve their vocabulary, discuss and have fun with some silly excerpts taken from court cases. 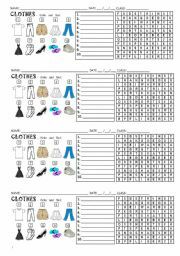 Wordsearch about clothes (t-shirt, skirt, shorts, pants, jeans, sneakers, dress, shoes, flip flops, socks). 4 activities per page. Students have to listen to the greetings the teacher will say and number the pictures. Then, they have to write the correct greetings under the pictures.